These are two aspects of Moral Truth, Moral Law, what is Right, Good and True that we can choose to integrate into our lives because we Care for Truth and “Love” Truth, or reject in our lives because we are apathetic and cowardly fear the responsibility of living in Moral Truth. The principle of non-aggression, non-violence, doing no harm and ahimsa can be referred to through the symbolism of the “Sacred Feminine” to not engage in actions that create, generate or manifest evil, immoral, wrong or negative outcomes for other innocent beings. This includes not only abdication and negation from participating in such actions, but also in not supporting these actions indirectly. The principle of justice, doing what is right, self-defense and the defense of others, can be referred to through the symbolism of the “Sacred Masculine” to act in defense of moral truth violations where violent actions are creating, generating or manifesting evil, immoral, wrong or negative outcomes for other innocent beings. This includes not only having the self-“love” and self-care for yourself, your moral concerns, and your rights to not be violated, but also of caring for others, their concern for life and liberty, and their rights to freedom and to not be violated, to be free from harm. Think and learn more correctly. Learn about the moral truth. 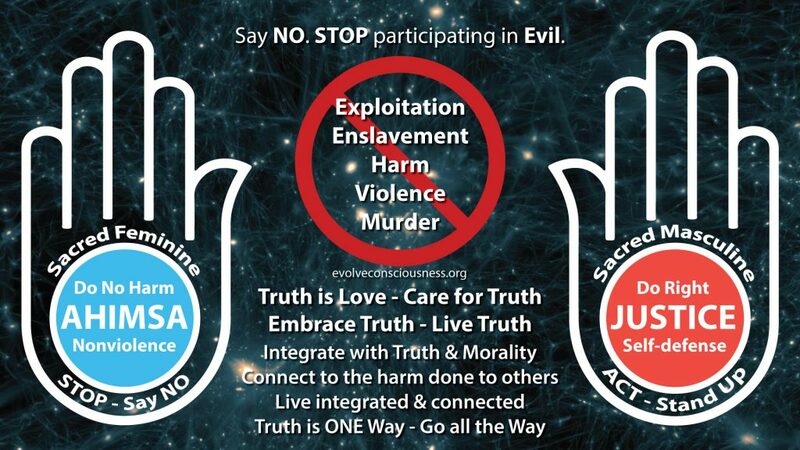 Learn about what is occurring in reality and in your own consciousness that allows you to support evil. Say NO and put a full stop to the creation of evil that you and others do. These are both principles of standing for Moral Truth and not compromising. We can choose the Wisdom of Right-Action. We can choose to alter, change, improve and better ourselves ingreater degrees of embodiment with these two components of Moral Truth that we are all capable of developing. We need to dig deep to the root causal core foundational factors that have usengaging in wrong-action, and no longer support these flawed foundational axioms that we think are “right, good and true”, but are instead lies, deceptions and illusions. Take the higher, realer, truer path and way of life to actualize, realize and individualize greater potential Moral Truth into your core being, actions, behaviors and way of living. We, humans, are the ones creating the aggregate suffering in the world. We are the only ones who can stop being cowards and fearing the shame, guilt and the moral judgment of our actions. Freedom or slavery. Anarchy or chaos. Truth or consequence. Be right, or go wrong!